Actor, director, and artist Dennis Hopper staged performances of British poet Rudyard Kipling’s “If” throughout his career. 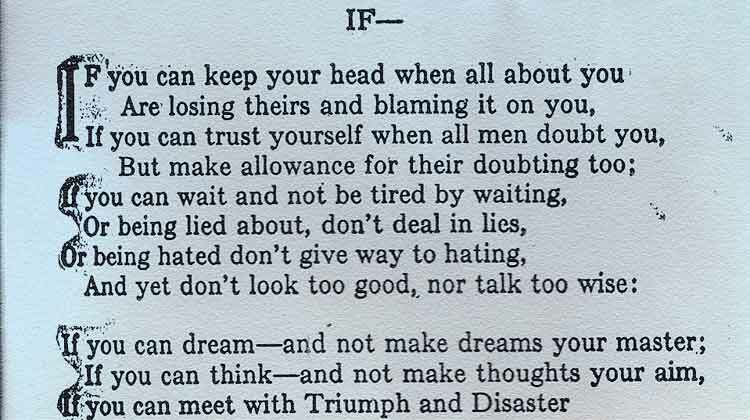 In Kipling’s original poem, the voice is that of a father offering prudent advice to the son on how to be a man and remain focused in the grip of conflict. The conflict discussed in Kipling’s poem is an external as well as an internal one. Kipling’s real inspiration for the poem was Sir Leander Starr Jameson, the British colonial politician, and leader of the botched Jameson Raid of December 1895 which intended to trigger an uprising by the primarily British expatriate workers against the South African Republic government of Paul Kruger. The uprising never happened, but the incident was a slow trigger for the Second Boar War of 1899 to 1902. Hopper’s interpretation of Kipling’s “epic evocation of the British virtues of a ‘stiff upper lip’ and stoicism in the face of adversity” reimagines the poem as a declaration of creative intent. Hopper’s free and fluid use of the poem, and his own persona of 1960’s hippy radical, strips away the father’s authoritative voice, the iffy colonial overtones, and the stoicism of British virtues and allows the poem to become an artistic manifesto to oneself. Hopper’s first recital of “If” came in 1971 during the Johnny Cash Show. Before Hopper stepped up to the stage he commented to Cash, and the audience that “‘If’ is the middle word in life.” which offered a different pretext to the performance that many in the audience would have expected. Wearing the countercultural uniform of denim jeans, shirt and jacket, matched with a cowboy hat and boots, Hopper performs the poem under a solitary spotlight to the live audience. His reading is measured and calm, tailored towards the mostly middle-class and straight-laced audience of the Johnny Cash Show. are delivered with slow precision, yet Hopper elaborately screams them into the microphone. The audience whoop and cheer him on giving the reading all the feel of a Beat performance, or an early example of slam poetry. Again before the performance of the poem begins, Hopper comments to the audience that “If is the middle word in life in the English language” emphasising the importance that the poem’s statement is one of seizing the moment in a creative manner, as opposed to an aggressive front. Here Hopper employs Kipling’s ‘If” in the contextual manner in which it was originally written: praising the actions and guile of a strategic military officer. Many years later Hopper gave a more measured and sober reading of “If” for a German documentary entitled Create or Die that regarded his life, work, and art. The reading here dispensed with the earlier dramatics. With his distinguished grey hair, and salt and pepper colored goatee, Hopper’s appearance is certainly more mature in body and mind. The performance lacks the theatrics of earlier readings, yet in the context of the documentary’s subject matter, that being his remarkable work ethic, and creative integrity the use of “If” again becomes a artistic manifesto. However, the difference here is that the older Hopper is not making the declaration for future creative endeavours, but to past ones. wonderfully reflect the triumph of Easy Rider, and the perceived disaster of The Last Movie. Easy Rider’s success allowed Hopper creative control and final cut on The Last Movie. He choose to take the relatively straight-forward screenplay conducted by himself and Rebel Without a Cause screenwriter Stewart Stein and produced a shocking and destabilising art film. His triumph in artistic freedom was also his disaster in commercial terms. Yet as the poem states, Hopper treated these results the same. He staunchly stood by his film. As an actor I read a book called Six Lessons in Acting by Richard Boleslavsky, and in it he says “have you read the great literature, have you seen the great paintings, do you know the great sculptures, do you know the music of your day” so I went off to find paintings cause I thought it would enhance by life as an actor. Hopper’s art collection was not just the accumulation of famous names for monetary gain, but an artistic act within itself. For Hopper the ownership and custodianship of art was another phase in the creative process. summarises Dennis Hopper’s artistic accomplishments. As spectators we have an incredible amount of output to explore. His work in film is the most obvious point of entry, but recently discovered photographs taken in the 1960’s, are brilliant documents of the era that show Hopper had an eye for capturing social and cultural importance. His rediscovery as an artist is still ongoing, the full distance has yet to be run. Dennis Hopper’s lifetime was an experiment in constructing a truly inspired, transcendent, and artistic existence. “If”, the poem, and as we were continually reminded, the middle word in life, was seen by Hopper as the continuous possibility of “what ifs”. God sent me out today with a will to live breathe eat and dream free. RIP Dennis Thank you will have to do it’s all I have to give you now.